Honor, tradition, and pride are synonymous with the Penn State University experience, whether you’re currently enrolled, alumni, staff, or a visitor to one of its 24 campuses. University Park, its main campus, is the location of the Penn State All-Sports Museum which upholds the Penn State ideals of honor, tradition, and pride by paying tribute to 34 current and former Varsity sports. The Penn State All-Sports Museum, located in State College, Pennsylvania, features two stories of exhibits. Physical displays highlight Olympic medals,the Heisman trophy, a collection of items from legendary football coach Joe Paterno, and other Penn State sports memorabilia from championships to mascots. Interactive kiosks display searchable information about exhibits within each kiosk’s vicinity: sports schedules broken down by year, team records, picture and video galleries, and an impressive search function so the visitor can easily learn more about their favorite student-athlete, coach, team, season, or even a specific game. Until recently, the museum was struggling to manage the massive amount of sports data their old kiosks displayed, making updates challenging and time consuming. Museum staff needed a way to remotely manage the data from one place through a user-friendly interface. In addition, the existing kiosks were becoming old and outdated. When the museum decided to upgrade the kiosks, it sought out Pennsylvania based Marketechs Design Studio. Marketechs’ vital role was to design and assemble the kiosks, determine where each kiosk would be placed, remove the old kiosks, and install the new ones. Marketechs partnered with fellow Pennsylvania-based Livewire Digital for the application programming. Both companies are run by Penn State alumni who were thrilled to be involved with this project. Penn State All-Sports Museum’s seven new touchscreen kiosks use Livewire’s eConcierge CMS (Content Management System) with a Sports Management add-on which accommodates future data input by museum personnel. 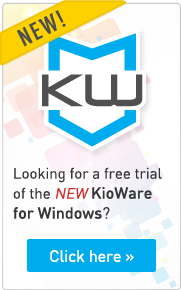 Livewire’s eConcierge system is built on KioWare kiosk system software. The functionality provided by this enterprise-level solution includes the following: configurable attract screens, kiosk health monitoring, usage statistics, the ability to remotely push content to the kiosks from a user-friendly web-based interface, and application lockdown to secure the museum’s sports data and network. The eConcierge CMS, paired with KioWare Full with Server, is completely integrated and accessible to the user all from one interface. The new content management system “allows us to store a vast variety of data in one place as well as make all the information searchable by the public,” said Ken Hickman, director of the museum. museum experience through their interaction with exhibits from all of Penn State University’s sports, both past and present. allowing users to access only the application. Each client has the ability to customize KioWare to his or her needs, with a product line ranging from basic browser-lockdown to server based remote monitoring. Marketechs Design Studio has extensive experience managing and executing the full scope of commercial projects from designing, developing graphic designs, producing graphic murals, fabricating designed exhibits, constructing shipping containers, offering rental and purchase opportunities, handling show freight round trip transportation, arranging for show site services & labor and providing Marketechs staff to supervise on-site installation and dismantling. One of Marketechs’ goals is to become a partner tasked with applying its expertise to trade show exhibits, fixed exhibits, museums, hospital & university lobbies, and other areas of your business. To learn more about other self-service solutions running KioWare, read more Case Studies, specifically Museum Kiosk Brings Interactive Information to Visitors and Da Vinci Discovery Center Discovers Kiosks. If you’re looking for innovative ways to have your museum visitors interact with your content on kiosks, check out Interactive Kiosk Uses - 15 Odd, Ordinary & Obvious Kiosk Uses. Contact KioWare Sales to learn more about how self-service deployments can improve your guest experience, encourage interaction, and help you easily manage content. Copyright © 2005 – 2014 Analytical Design Solutions, Inc. All rights reserved. Portions of this material may be reproduced online with attribution, copyright text, and a link to http://www.kioware.com. This material may not be reproduced in print without written permission from Analytical Design Solutions, Inc.